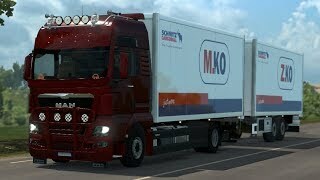 Added: New chassis 8×4 BDF (and Box VAK). Added: Painted Mirrors (Front and Side). Added: Refrigeration unit Mitsubishi TU100SA. Sold in MAN Dealer shop. 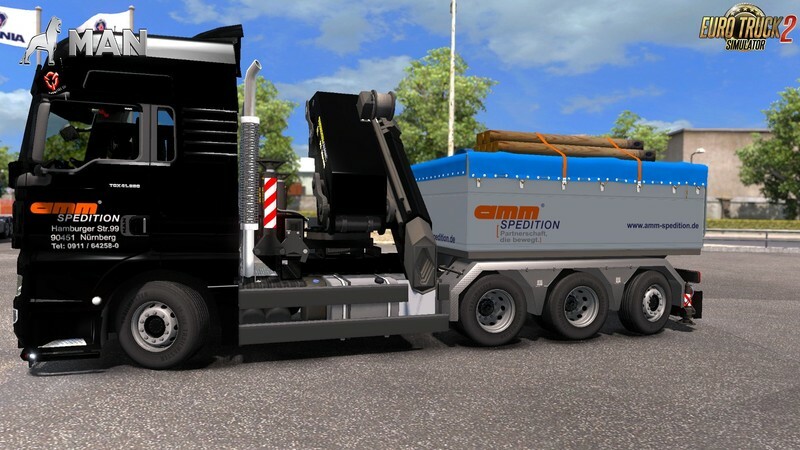 Added: New chassis with a hook height of 800 mm. 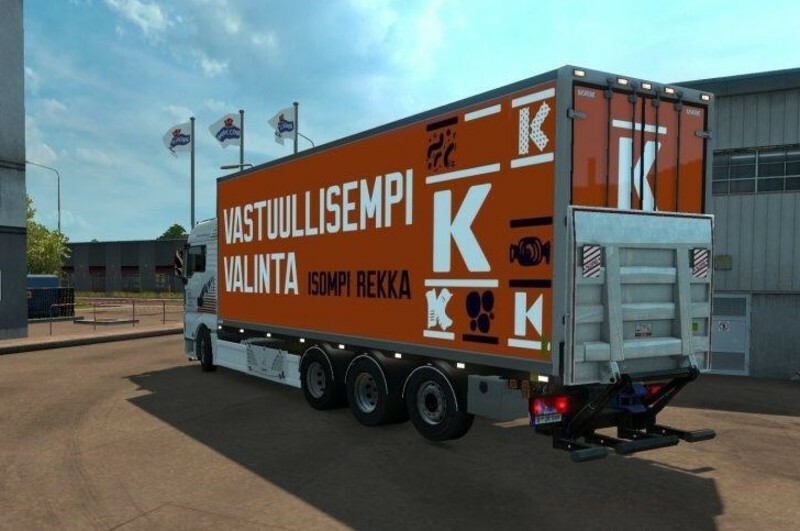 (only for trailer VAK). Added: New trailer with dolly VAK. 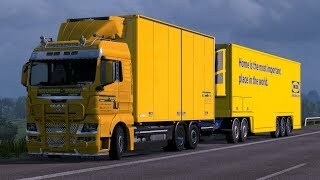 Added: New BDF Trailer (Krone Profi Liner Long with trolley). registered in Scandinavia and Germany. 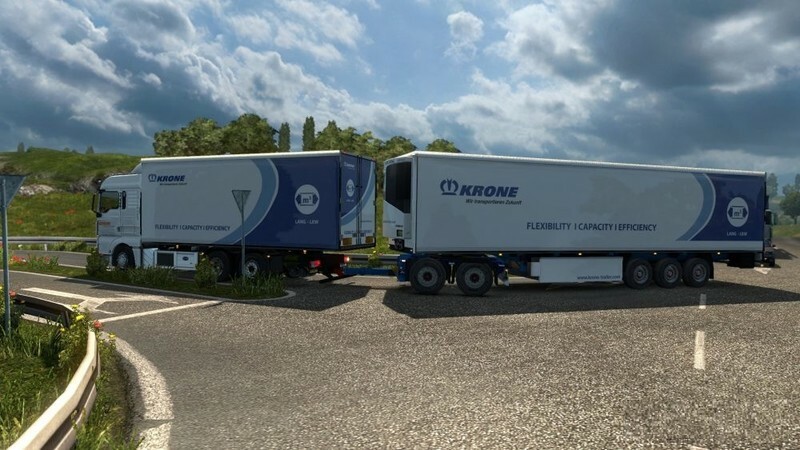 Added: Empty Trailer Krone with trolley. Fixed: red glow of the GPS. 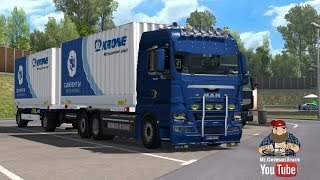 Added: New BDF Trailer (Krone Long HGV with trolley - two versions with a blue and black trolley). registered in Scandinavia and Germany. 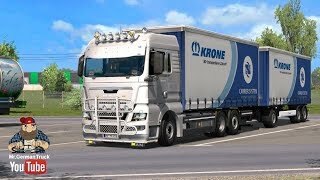 Added: Box Body Krone Cool for rigid chassis. 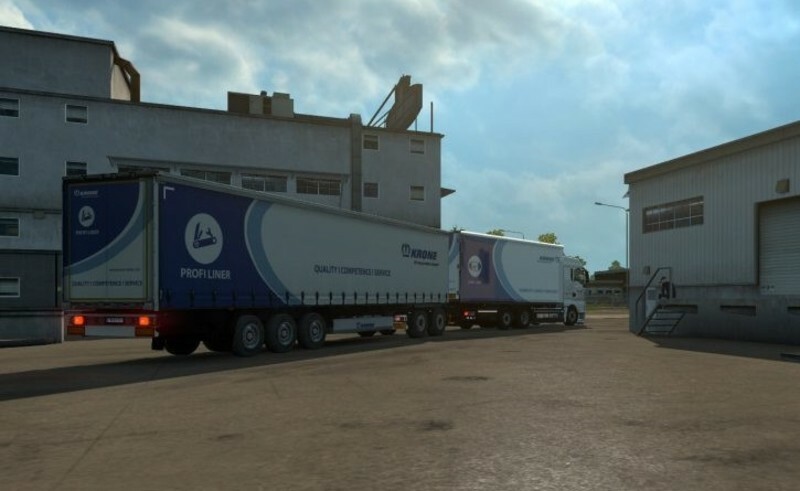 Added: New BDF Trailers (Schwarzmüller Tank 2-axle with trolley). 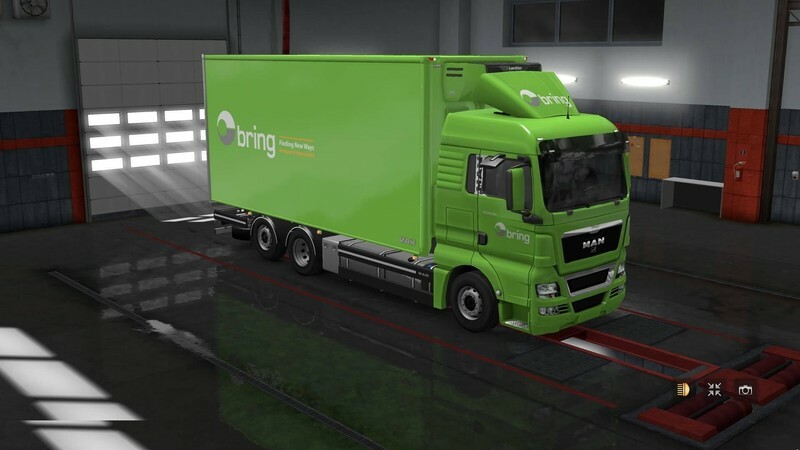 Added: New chassis BDF Rigid with Tank -(Schwarzmüller Aluminium tank body for 3A truck – side-mounted cabinet – 19,500 l). 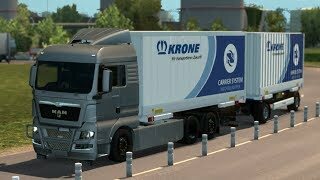 Fixed: Changed UV map template trailer and Containers Krone. 7) Sun visor with text (Your text: replaced texture //model/sunvisor_text/text.dds, Do not forget about the alpha channel). 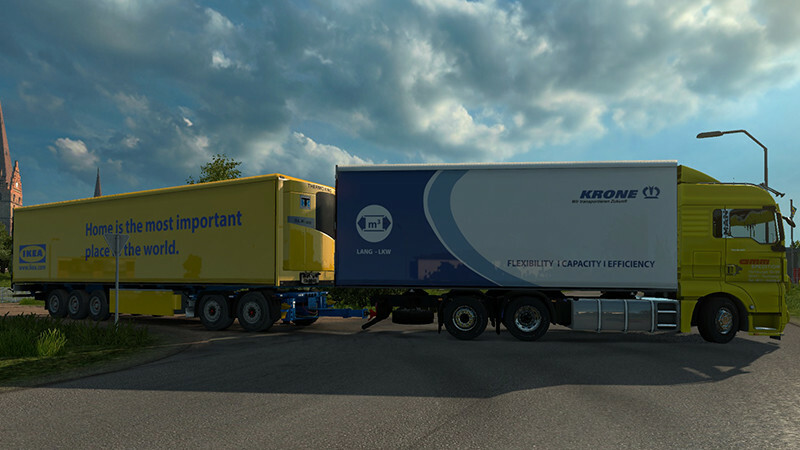 Added: New BDF Trailers (Krone Steel Box, Box carrier, Load carrier). 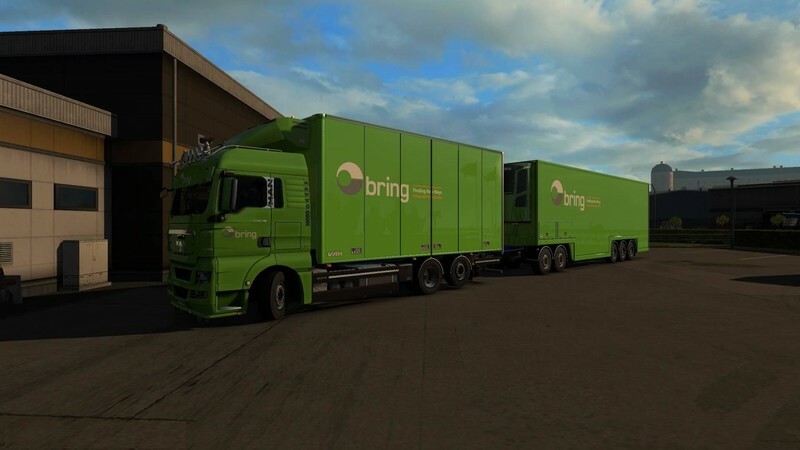 Added: For BDF Rigid chassis bodywork – Krone Steel Box, Box carrier, Load carrier. 6) Sun visor with text (Your text: replaced texture //model/sunvisor_text/text.dds, Do not forget about the alpha channel). 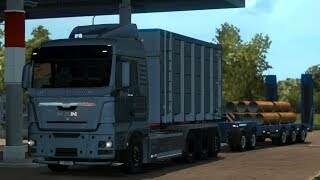 Added: New chassis 4x2 LL Rigid BDF. 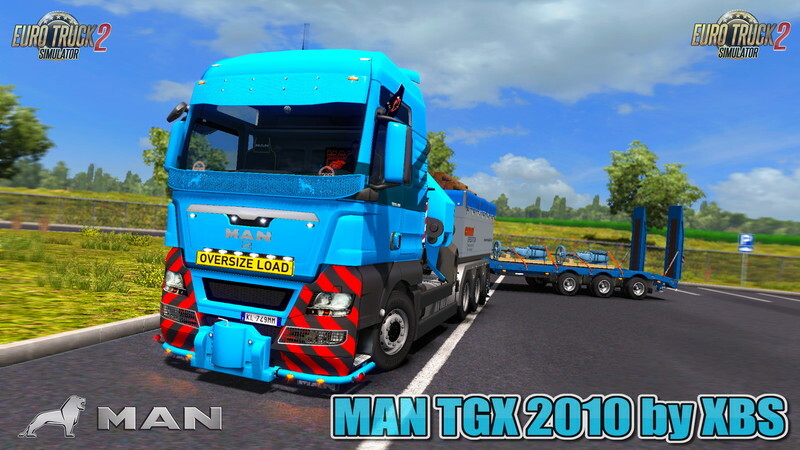 MAN TGX 2010 v4.3 by XBS (1.28.x) for Euro Truck Simulator 2 game. 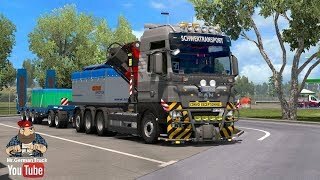 Added: New bodywork for chassis 8×4/4 with crane. 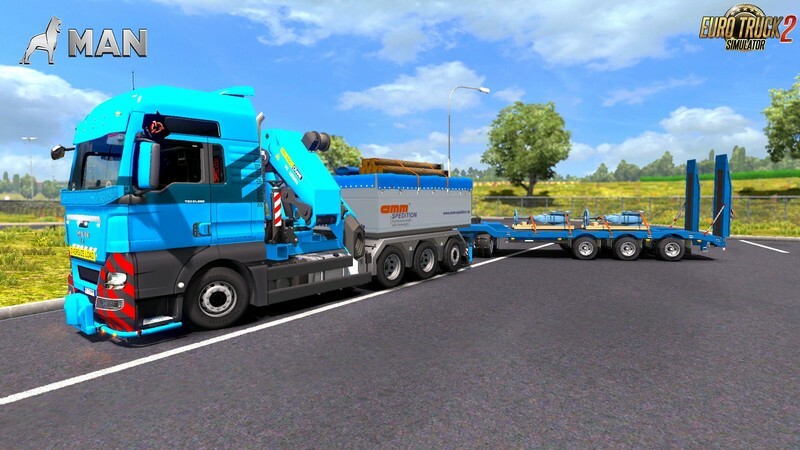 Added: New bodywork Hooklift for chassis 8×4/4 with crane. Added: Four rear bumpers with outriggers for crane (two metal and two painted.). 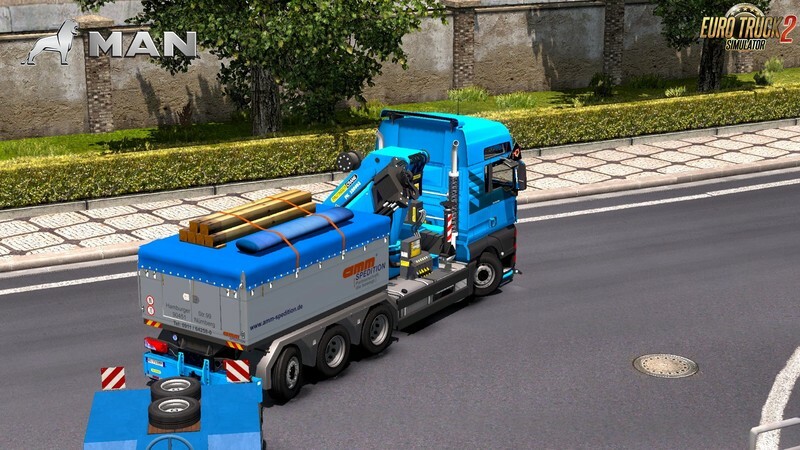 Added: Two steel rear fender chassis 8×4/4 with crane. 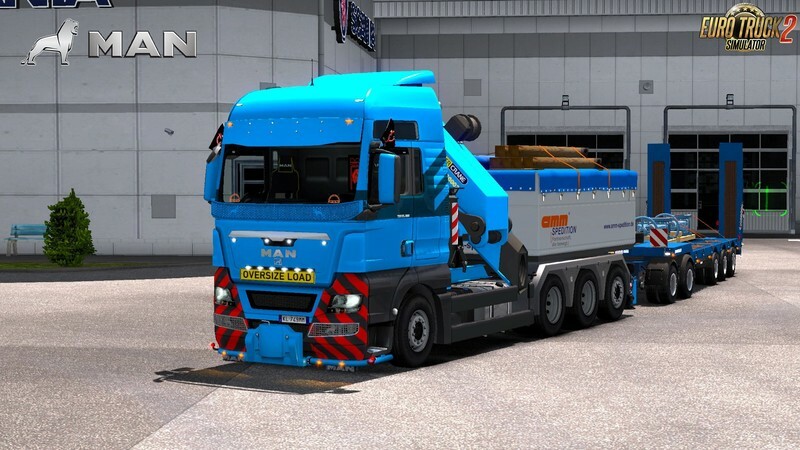 Added: Sideskirt for chassis 8×4/4 with hooklift. 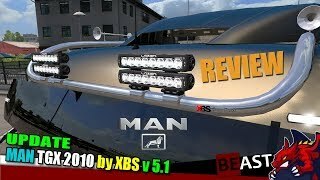 Remade: 3d model of tail lamps. 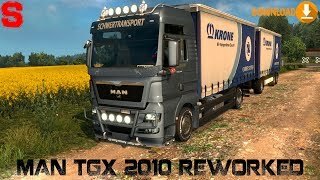 Remade: of frame chassis (8×4/4 crane). 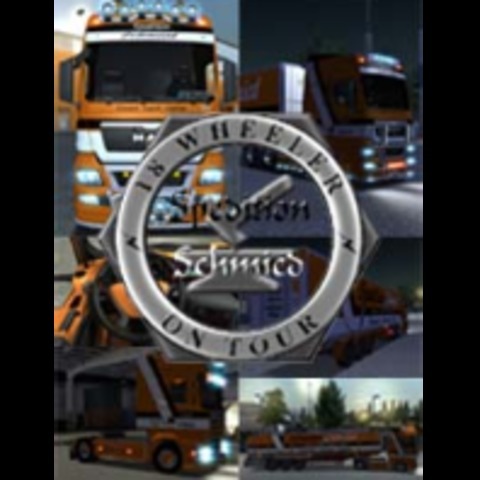 Added: New trailer schwarzmüller 5-axle low loader with trolley (7 Cargoes). 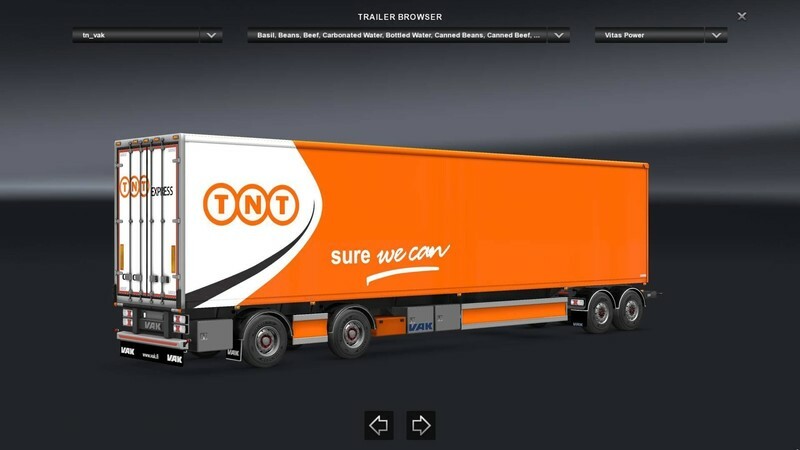 Added: Animation button (Lift axle stick). Added: Animation Automatic transmission gear selector. 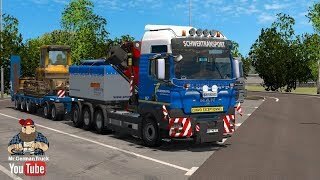 Added: New BDF Trailer with trolley (only v1.28). 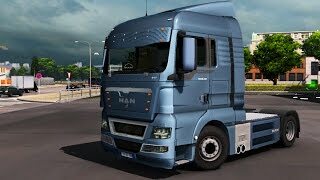 Added: Badge TGX.41 for chassis 8×4. 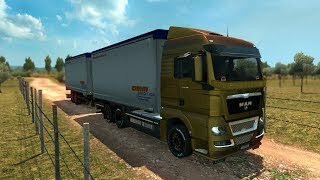 Fixed: Cargo BDF for the version 1.28. 3) Sun visor with text (Your text: replaced texture //model/sunvisor_text/text.dds, Do not forget about the alpha channel). 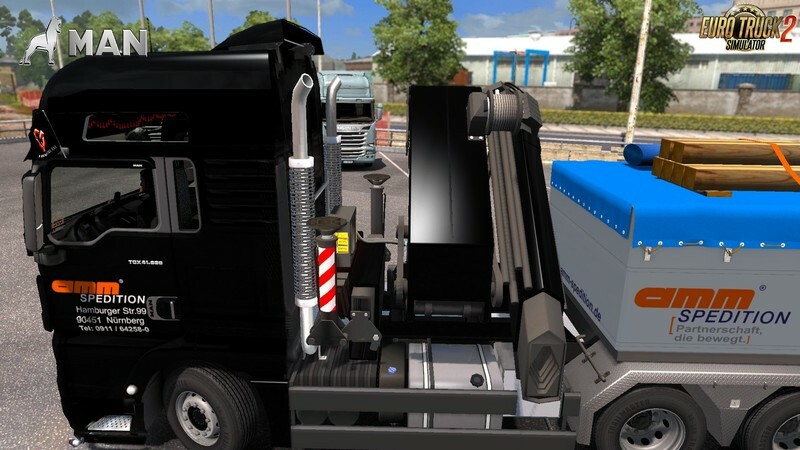 Added: Sideskirt for chassis BDF (cage-black). Added: Sideskirt for chassis BDF (cage-paint). 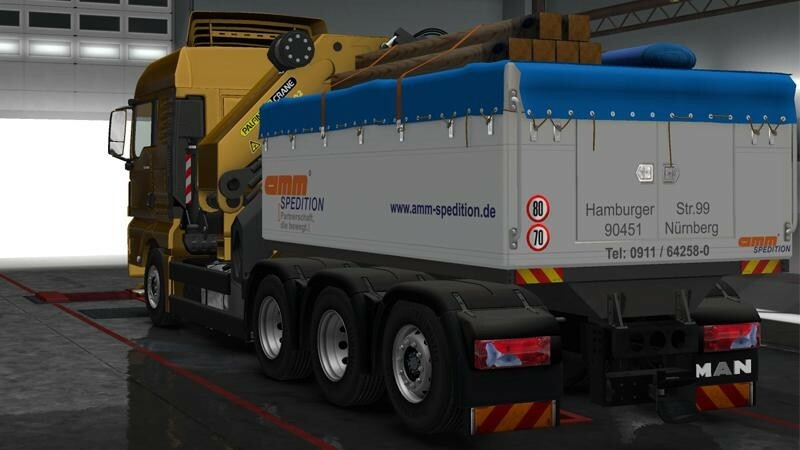 Added: Sideskirt for chassis BDF (plate-paint). Added: Fully painted front bumper. Added: Three Rear Bumpers Dutch style. 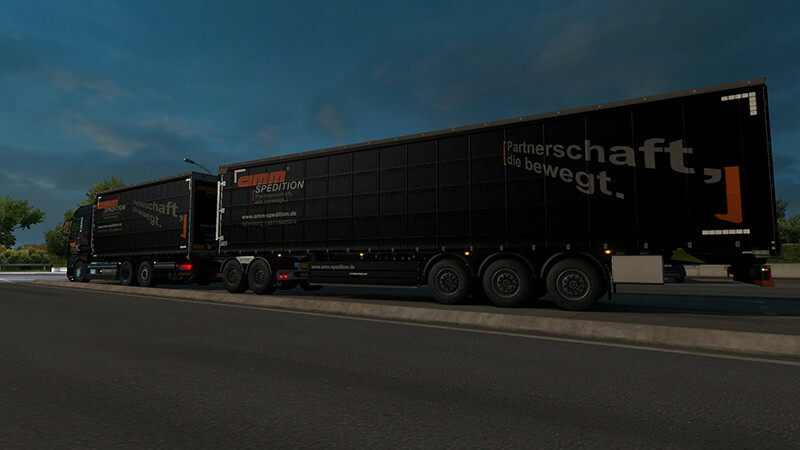 Added: Several mud flaps for bumpers Dutch style. Remade: Rear Fenders (All chassis). 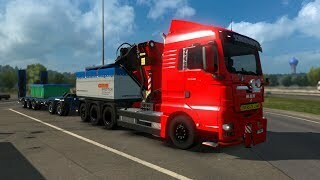 Added: New Chassis 8x4_4 with a crane and a lifting rear axle. 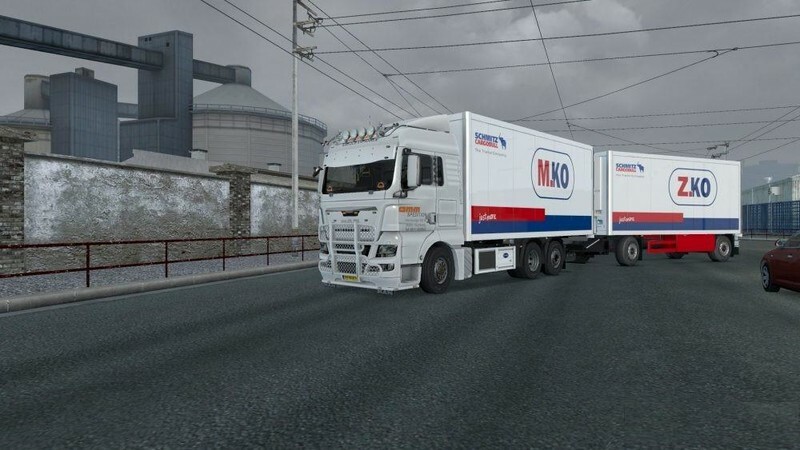 Added: Sideskirt stock_cage for 8x4_4 chassis. 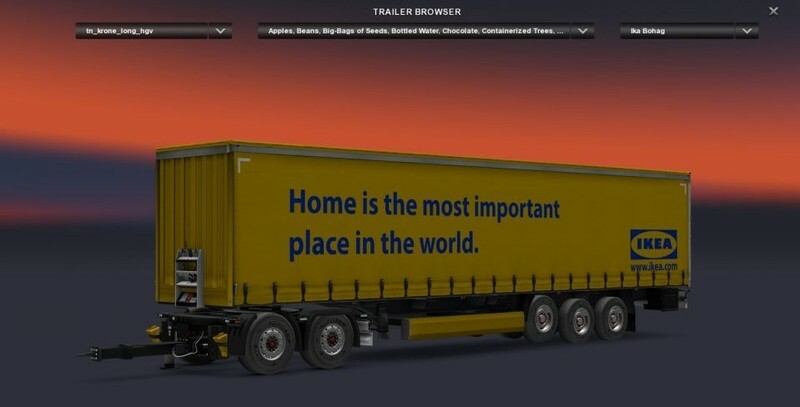 Added: Sun visor with text (Your text: replaced texture //model/sunvisor_text/text.dds, Do not forget about the alpha channel). Added: Huge Roof bar (xl cabin). 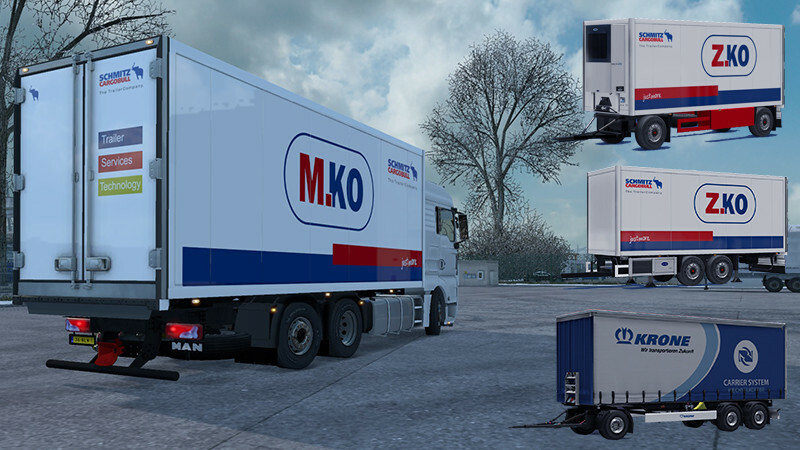 Added: Gearboxes for heavy loads (ratios 3.36 and 3.63). Added: Animation parking brake stick. 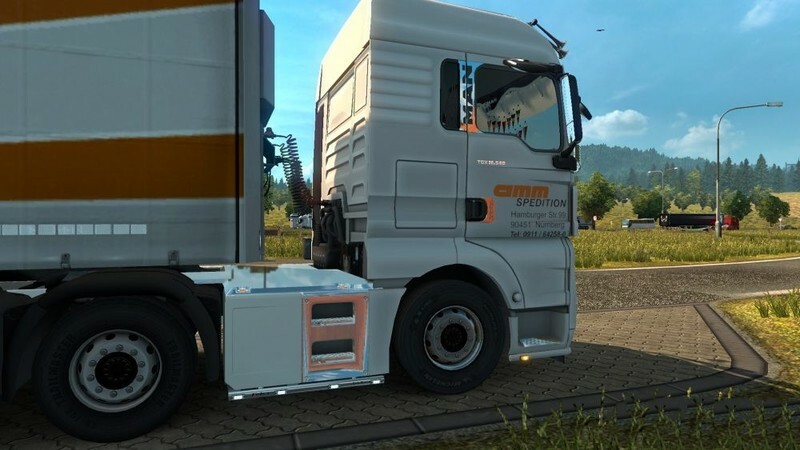 Added: Painted rear fender 4×2 chassis. Added: Two new front grills. 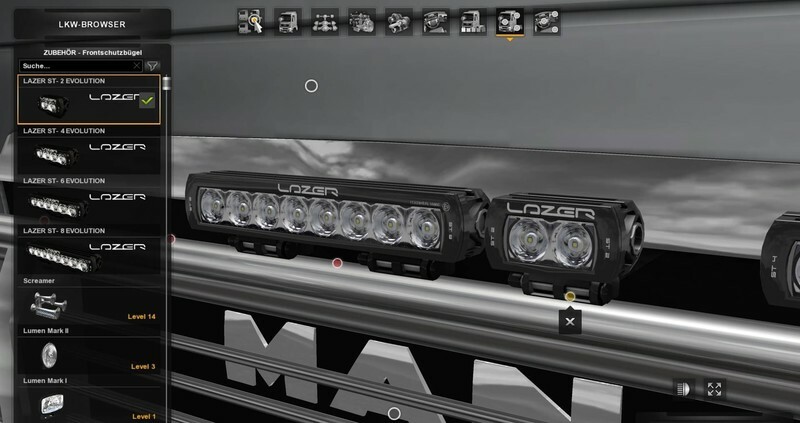 Added: For chassis 8×4 bumper (heavy duty). Added: Tow hitches for bumper (heavy duty). 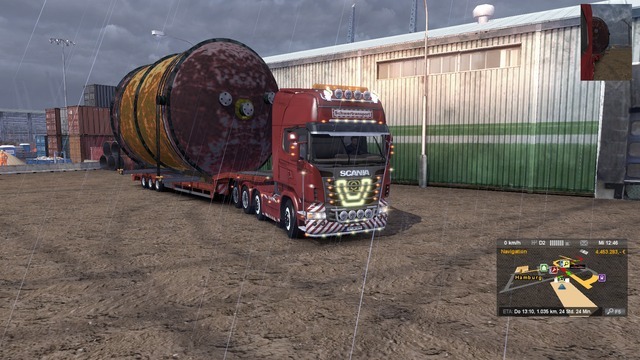 Added: Flags for chassis 8×4 oversize load. Added: Additional slots for the front mask. 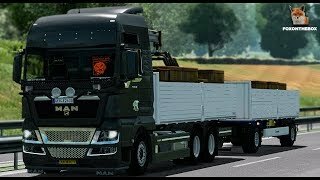 For the new add-on "Heavy Cargo"
Added: Wide Spoilers only for chassis 8x4 (All Cabins). 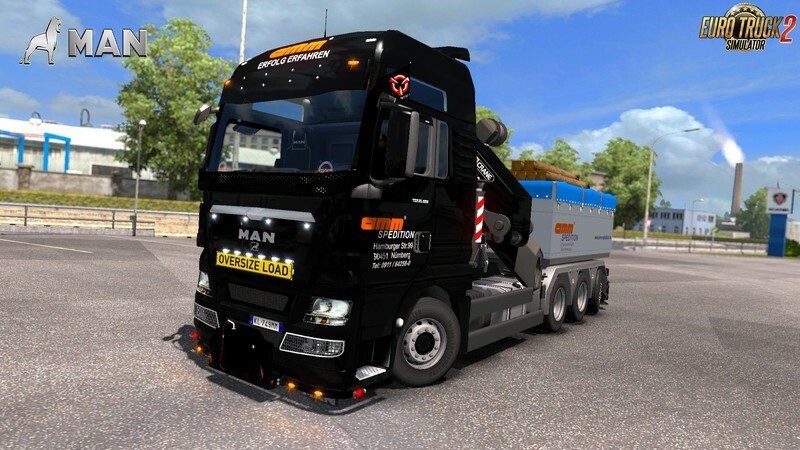 Added: b_grill Heavy loads for chassis 8x4 (Black and Colorable). Added: Equipment rack with additional radiator (water/air, oil/air) and fuel tank behind the cab. ( three jokes: Black, Paint, Paint+Chrome ). 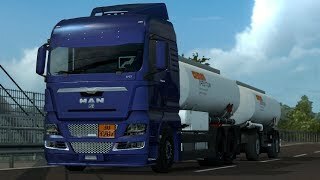 Added: Three Exhaust behind the cab only for Equipment rack chassis 8x4. Added: Two rear fenders for chassis 8x4 (Plastic and Paint). - Added: Three Painted Bull Bar. 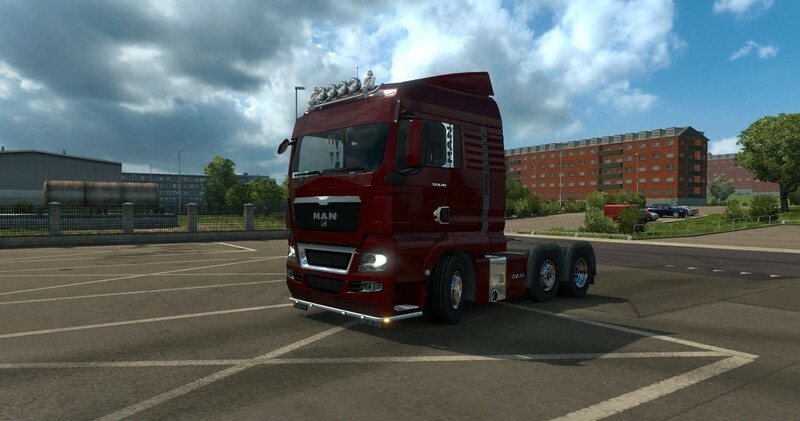 - Added: Painted Low Grill and Powerful chrome grill. - Added: Plastic and painted s_panel on the cab. 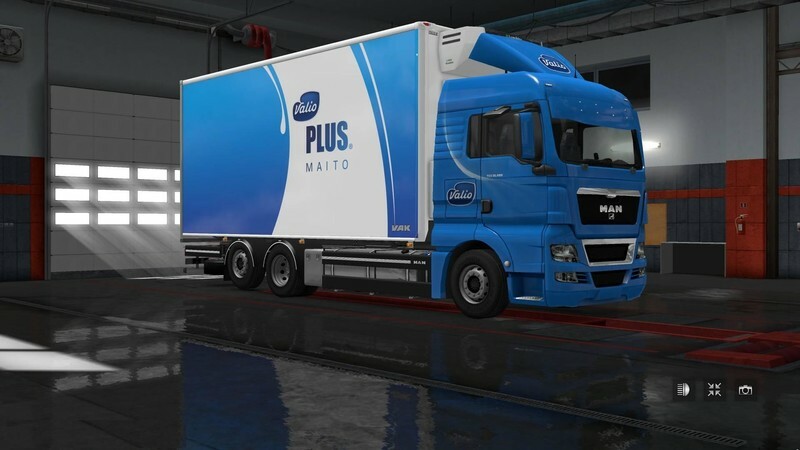 - Added: Chassis Cover (4x2, 6x2 only with sideskirts). - Adedd: Two BakBar (reverse light on the cabin). 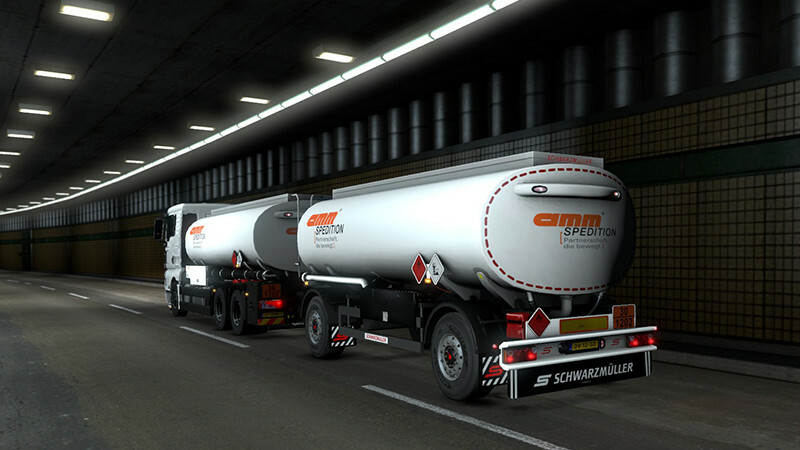 - Added: Rear Exhaust (Vertical pipes). - Added: Front Grill Guard. 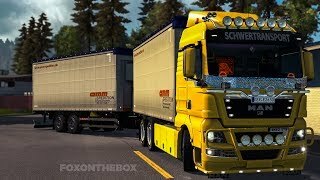 habe eine bitte kann mir einer oder der modder selbst ein anderes dashboard einbauen in den lkw ?? aber das nervige ist das der auflieget mit Dolly sogut wie nie auftaucht. Und wenn dann nur in scandinavien. 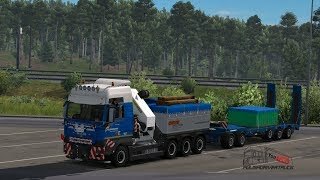 Beim 3 Achs BDF sind die Hinterachsen des LKW zu breit. Das heißt die Reifen sind breiter als der ganze Rest des Gespanns. Die Wechselbrücke wurde wahrscheinlich am Fahrerhaus angepasst aber leider ist die Brücke viel zu schmal für den Rahmen. 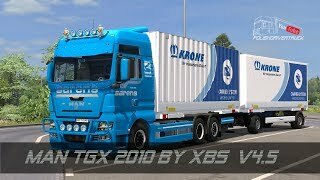 Das scheint jemand gemoddet zu haben der kein LKW Fahrer ist. Dieser Mod ist so leider nicht zu gebrauchen da es einem tierisch auf den Nerv geht wenn die letzte Achse breiter ist als die Antriebsachse und die Antriebsachse breiter ist als die Vorderachse. Sorry, aber ist einfach unrealistisch. Aber bitte nicht aufgeben, der Grundgedanke ist sehr gut. 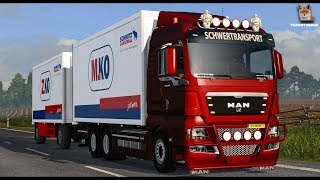 Ist nämlich - wie alle Mods von Mops80 ein Re-Upload! Leider ist er mittlerweile fast der einzige, der noch was auf Modhoster hochläd. 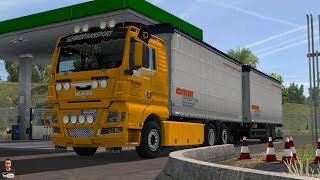 Vielleicht sollte man es umbennen in Mods80-Hoster - Die besten geklauten Mods. Nein, mal im Ernst. Das ist echt 'ne Frechheit von diesem Typen. 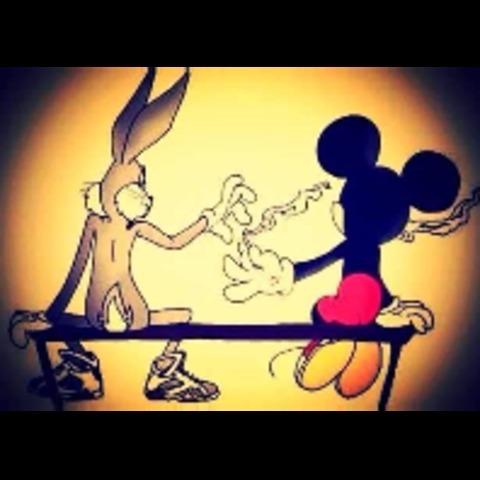 Aber was will man machen? Wenn man es meldet, reagiert bei modhoster niemand, also läd er weiter fröhlich geklaute mods hoch und verdient sich mit der Arbeit anderer 'ne goldene Nase. 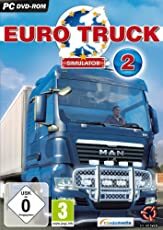 wo finde ich den mod im spiel? was für einen man muss ich kaufen? wo mach ich das tunning?